Dhaka – Bangladesh and the United States have agreed to work together with renewed efforts to counter the global menace of terrorism after the South Asian country was badly battered by a series of terrorist attacks claimed by Islamist militants in the past years. US Secretary of the State John Kerry made this statement after meetings with senior ministers and Prime Minister Sheikh Hasina during his nine-hour stay in Dhaka on Monday. Kerry arrived in Dhaka in the morning to hold meetings with the government officials, opposition leaders and civic actors nearly a month after Islamist militants killed at least 20 civilians including 17 foreigners at a restaurant in the capital. Wrapping up the brief visit, he left Dhaka in the evening for New Delhi. The top US diplomat narrated the acts of terrorism carried out by the ISIS, al-Qaeda and other extremist groups and vowed his country’s determination to thwart the menace across the globe. 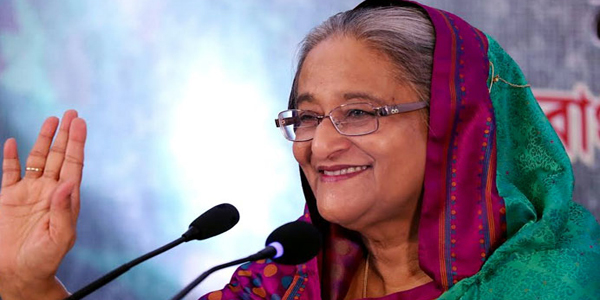 As he earlier offered counter-terrorism assistance, the official meeting with his Bangladeshi counterpart was dominated by the security issue alongside other bilateral matters. “We, today, agreed on additional steps by which our intelligence and law enforcements will work together in order to try to get ahead of this…,” Kerry told reporters after meetings. The top US diplomat referred to the July 1 cafe attack and said it was an outrage clearly “designed to divide Bangladesh, designed to try to cut off this welcoming society from the outside world”. The Islamic State terrorist group claimed responsibility for the July 1 attack. However, the government said a home-grown group which it had outlawed in 2005 – Jumatul Mujahedeen Bangladesh – was behind it. Dozens of small scale attacks have been carried out during the past several years directed at members of religious minority, foreigners, bloggers and security officials to create an internal strife, he observed. He said United States work very closely with Bangladesh and other partners to defeat vicious terrorist networks, particularly those of Daesh (Islamic State of Iraq and the Levant) and al-Qaeda. “We think there is much we can do to cooperate in this regard,” Kerry said adding that he, in meetings with Bangladeshi officials, talked about all aspects including the importance of inclusivity of working with people in a democratic process. The US, he said, has already been working with Bangladeshi police, Madrassa (religious schools) students and conflict mitigation. “So I’m confident that our assistance to Bangladesh will increasingly be designed to help the government address terrorism threats from domestic and trans-national organisations,” Kerry said. He hoped the US and Bangladesh would be able to build additional capacity for effective counterterrorism efforts. Bangladeshi Foreign Minister Abul Hassan Mahmood Ali said he had a candid discussion with his US counterpart on issues related to all bilateral issues, including security matters. In addition to official talks with Ali, Kerry also met with former prime minister Khaleda Zia and a number of civic leaders during his brief stay. The US offered Bangladesh counter-terrorism assistance after last month’s deadly cafe attack in Dhaka’s diplomatic zone. On Saturday, police claimed they had killed one of the masterminds of the cafe attack. At least 40 people, including secularist bloggers, writers, priests, gay rights activists and academics, have been killed since 2013 in attacks claimed either by the Islamic State group or by al-Qaeda’s Indian chapter.